“If everyone wants to gather around, we’ll get started!’ I announce in my friendliest voice, trying not to sound too excited. Nobody moves. The families that have come to my workshop at the Cambridge Family and Children’s Services Center (CFCS) huddle in the very back of the room, looking tired, stressed, and somewhat uninterested in what I have to offer. I cannot blame them; most are young families, some recently immigrated, and all are probably exhausted just trying to make ends meet, care for their children, find work, and maybe carve out some sense of community in their new home. Do I really expect them to be cooking meals from scratch with fresh, whole ingredients? It sounds like a lot to ask, but my goal is to show them that it is easier than they think. That’s what the Plenty program is all about: not just teaching cooking skills, but teaching home cooks how to work with what they have, use up everything they buy, and make good, nutritious food fit into their life. With every workshop I teach, I also always learn something. One of the first hard lessons was that restaurant work is very common in low-income households, so many participants already knew all about cooking: I was given advice on how to cut an onion, when to add salt, and often overruled on my seasoning choices. Rather than being frustrated by this, I’m always encouraged by participants who get involved and want to make the recipe come out their way. Caring about what you eat is the most important step towards a healthy diet. 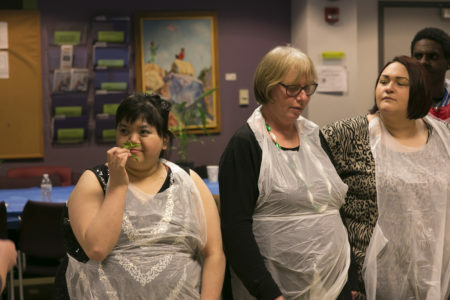 With some persistent encouragement, the families at CFCS slowly started to get involved as well: one moved closer to peer into a bowl as I mixed a dressing, another followed her two children up when they wanted to touch the brightly colored peppers and see the inside of the red cabbage I’ve cut in half. Little by little, they start to interact with me, but more importantly, with each other. By the time we sit down to eat together, they are laughing and talking. One has never tried lentils before, and another asks if she could add cilantro instead of basil to the salad? Regardless of the recipes and facts I’ve tried to teach, they’ve started a conversation about food, and they’re sharing their own knowledge with one another. Trying a new dish has gotten them thinking about how to make it their own, and the creativity slowly emerges. “I like to think of cooking as confidence,” Noreen, Deputy Director at CFCS, told me during a recent visit. Confidence and permanency, she explains, are the two things most often in short supply for the people we serve. CFCS helps many different groups, from adolescents in foster care, to struggling families, to individuals with developmental disabilities. 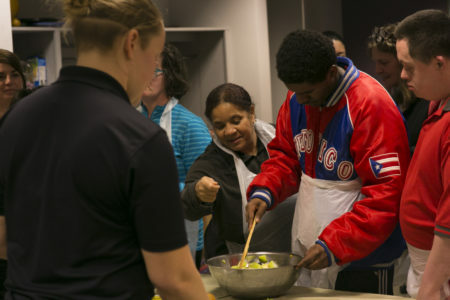 Cooking can be a great way to build confidence and a sense of community throughout their programs. 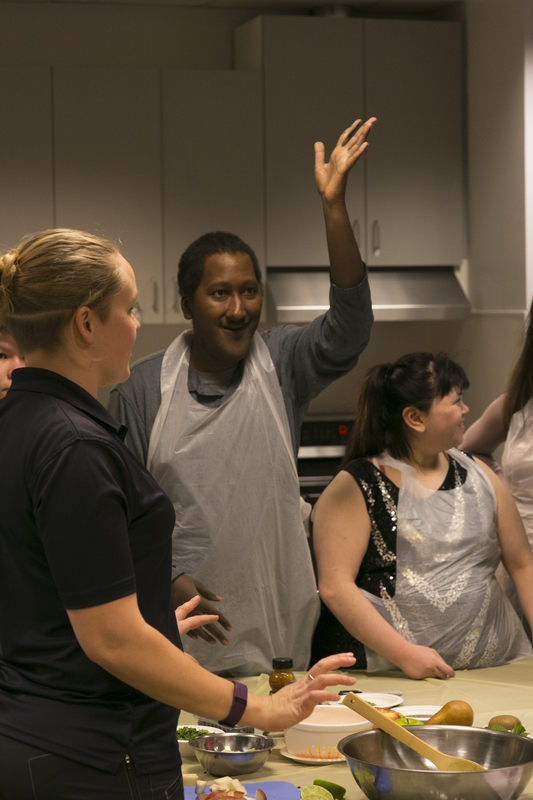 “If you have something you can cook and share with your family, or invite your friends over for, that really gives you some confidence and is a great tool to use to strengthen connections with those important to you,” says Noreen. Individuals or families can learn to function better as a group through cooking and sharing a meal together. At a recent workshop with the CFCS teen boys, most of them unaccompanied minor refugees, we were making shakshuka and hummus together. As I talked through the recipes, I realized many participants did not speak much English. But as I cooked, they watched, pointed, asked questions, and helped each other translate from English to Spanish to Eritrean and Arabic. Half-way through the workshop, they had a chosen spokesperson who asked the questions, and by the end, they were offering suggestions and sharing their favorite seasonings (they introduced me to the wonders of Goya Adobo – I let them keep my shaker of red pepper flakes). I learned afterwards that the young man who had led the group in asking questions had not participated in any group activities for months, and did not normally get along well with the other residents. Cooking a meal together, it seemed, had brought him out of his shell, and changed the dynamic.